For hours I sat here, just with a beer while Msafiri was staying in the hotel with malaria. I am drawn into this peaceful state inside, which sometimes happens to you on an empty summer day. The water made small wave sounds while a few young lads are sitting on a few stones in the Lake, while I’m opening up for the silence that hangs over the water. A little paradise on Earth. 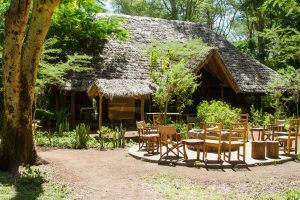 A pendulum of small Maasai Boma with its suggestive name Nainokanoka lies sleepy in the morning light. We descend hiking and hungry into the valley to get some breakfast. We are receiving sweet white bread with butter and orange slices. And we’re sitting peacefully on a shuka and watch the village stretch the body and come alive slowly. We are not talking which brings peace upon us. Soon we walk to a shady spot where we gather with ten women to bring existance to all beads I brought with me from the Netherlands. We walked two days through forests, rolling hills, charming villages and stillness when we arrive in dusk at a group of jagged rocks. We climb them to reach a large, flat stone. Seventeen hundred meters above the steppes a setting sun breaks through the clouds. 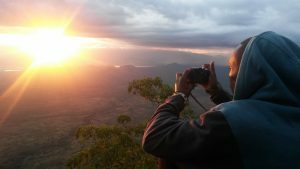 Never before I was standing loose and free at high altitude while the Sun showed itself as the divine itself. Light rays shine to all directions while the country is disappearing in a dark cloak. I cry overwhelmed as I feel to this grand moment. 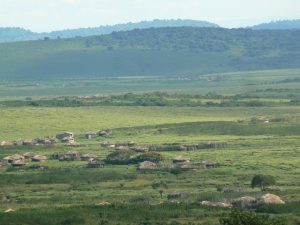 Hiking at the open plains behind the thriving town of Mto Wa Mbu we go towards Lake Manyara. Everywhere on the plains are groups of cows surrounded by Maasai children in red shukas who are supposed to protect the cows. The open plains open my chest and I feel free. Nowhere fences, nowhere barriers, nowhere walls. The plains stretches open and infinite. Later as we come closer to the Lake we see the black contours of Buffalo. 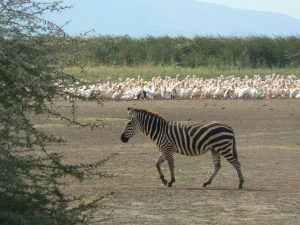 And before us a zebra walks in a relaxed way in front of a large group of pelicans. To be here. Wow! 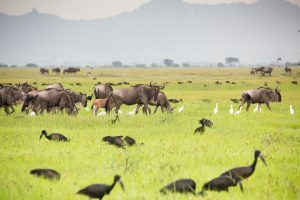 Serengeti is a flat area and yet it is less open and infinite than Lake Manyara. Everywhere are low bushes, umbrella trees, grass, low hills and ponds. In dry times the grass will be yellowish as we know it by the many nature films that are included here. But what happens to the land as the rains come and shortly afterwards is breathtaking. Almost transparent, fresh green colours wild animals with a fairytale background. It is not easy to resist the urge to get behind my camera to take this home with me and enjoy it in that moment. Thank God someone else did.